First, at the standby screen press *#06# to view your IMEI (International Mobile Equipment Identity), also known as serial number. 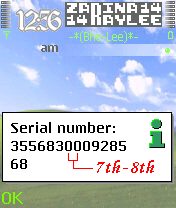 Then look at the 7th and 8th digit, that's the Manufacturer's Code (MC). ! Refer to this Manufacturer's Code to know your phone's quality and where they've been manufactured. ! 00 - Means it was manufactured in original factory which is the best mobile quality. 01 or 10 - Manufactured in Finland which is very good quality. 02 or 20 - Means your phone was assembled in Emirates which is very bad quality. 06 - Made in Flensburg, Germany (flare). 07 - Made in Flensburg, Germany. 08 or 80 - Manufactured in Germany which is faired quality. 13 - Means it was manufactured in Azerbaijan, which is also a very bad quality. 40 and 41 - Made in Easterinch, Scotland (UK). 47 - Very popular fake IMEI, There are thousands of phones out there with IMEI=000000470000000. 49 - Was found on a 8700 from China with fake IMEI. 67 - Made in Illinois, USA (most prototypes). 80 and 81 - Made in Tianjin, China. 92 and 93 - Made in China by EASTCOM in Hangzhou.